NBC recently finished filming it’s new game show, “Who’s Still Standing” hosted by Cash Cab‘s Ben Bailey. The show had some interesting moments. Some were questionable and others…disappointing. “Who’s Still Standing” plays off of the popularity of comic books by having one “hero” contestant placed in the center of a circle surrounded by 10 villain style opponent contestants. These 10 contestants are dressed in wardrobe intended to throw-off the hero by either down-playing their intelligence or up-playing their lack-of. Some unusual characters are also thrown-in with bright colors very similar to comic books. While on-set of this highly anticipated game show, we were entertained by what seemed like a basic game show, however, it’s stage mechanics make for a complicated production. 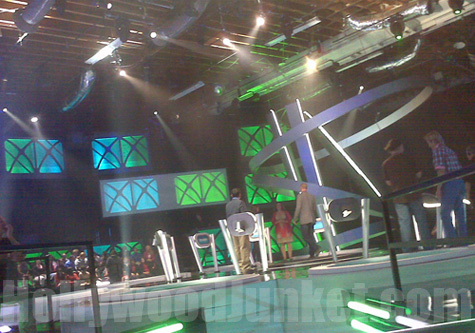 Many times the show had to be stopped due to malfunctioning of the trap doors on the stage that drop the contestants if they get a trivia answer incorrect. During the show’s third day of filming, an accident occurred on the stage in which three of the trap doors opened unexpectedly. It was stated by several audience witnesses that one contestant hit her head on the side of the hole which is padded. Another contestant was said to have grabbed the sides of the hole to stop his fall. He later returned to set on the last day of filming and had to be escorted by two of the production staff due to his injury caused by the unexpected fall. Medics were said to have rushed to the stage immediately to tend to the contestants. The day after the much talked-about accidental amongst audience participants, not a word was mentioned about it on the show by Bailey or any of the producers. During the last few days of filming the show, some game play to the show was changed. “Who’s Still Standing” went from giving away $2000 per correct question during the speed round to $1000. Also, the show allowed for 3 “passes” for hero contestants to pass trivia questions that they did not know to their head-to-head opponent to only 2 passes. If the hero contestant knocks out five of the ten trivia competitors then they have the option to walk away with the money that they had won up to that point. If they choose to “stay and play”, then they are given one more pass and a fact about one of their challengers that may help them to determine if they’d like to compete against them or not. This is where the game got really interesting. In two incidents that we witnessed, two of the hero contestants who had a very good advantage and favorable odds of possibly winning the $1 million grand prize if they continued to play, did not. One contestant was set on going all the way one minute. 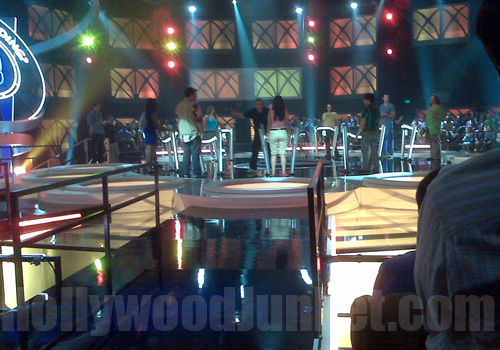 In the next minute, after show production staff entered the stage, he decided to walk away with the money he had won. Hmm…there seems to be an advantage to the show not having the contestants go for the $1 million! The show seems to be filmed as intended “game show fluff” strictly to throw some entertainment at television viewers and will most likely rely on the hype of contestants being dropped through the stage floor. In my opinion, not a serious game show. My question is, how is the show going to keep viewers coming back if none of the contestants make a serious attempt at winning the $1 million? We’ll be watching with everyone else to see how it all plays out.